Cooling is the process of thermal energy transfer via thermal radiation, heat conduction or convection. In industrial processes, cooling is achieved through various mechanisms requiring different equipment. The most commonly accepted industrial cooling mechanism is the use of a cooling tower. Typically located near a plentiful body of water, once through cooling systems continuously draw water from the source and discharge it after it has passed through the heat exchanger. By contrast, dry cooling towers and wet cooling towers recycle water continuously. Wet cooling towers, or open recirculating systems, differ from dry cooling towers in that the cooling water in a wet cooling tower is exposed to the atmosphere. This allows steam to evaporate each time the cooling water is recirculated. An open recirculating cooling tower design is preferred for promoting large decreases in coolant temperature and where feed water is an expensive resource. One drawback to wet cooling towers is that repetitive evaporation concentrates dissolved and suspended solids. These solids eventually reach a saturation point and begin to precipitate and deposit, leading to scaling or corrosion. When insoluble materials, like calcium carbonate, calcium phosphate, magnesium salts and silica, precipitate out of cooling water, they form solid deposits called scale. A layer of scale as thin as 1/64 inch can reduce heat exchanger efficiency by 15%. Reduction in heat exchanger efficiency leads to wasted energy and increased operating costs. Scaling may be promoted by variations in pH, temperature, alkalinity, and concentration of scale-forming constituents in water. Most metals used in cooling tower systems are very susceptible to corrosion. Surfaces must be kept clean to prevent under-deposit corrosion, which can lead to system failures. Corrosion can be uniformly distributed throughout the system, or it can be localized. Water may be treated with chemical inhibitors to extend the saturation point of insoluble materials and prevent scaling and corrosion. Water treatment with cooling tower chemicals is preferred to supplying fresh water due to environmental and cost concerns. Cooling tower chemicals can increase the saturation point in cooling water. However, there is a limit to the solids concentration or cycle of concentration that can managed by a chemical inhibitor. For this reason, dissolved solids in cooling water are reduced by removing or “blowing down” a percentage of water from the system and replacing it with fresh water. Cooling tower blowdown treatment is managed by using conductivity sensors to monitor cooling tower makeup water. 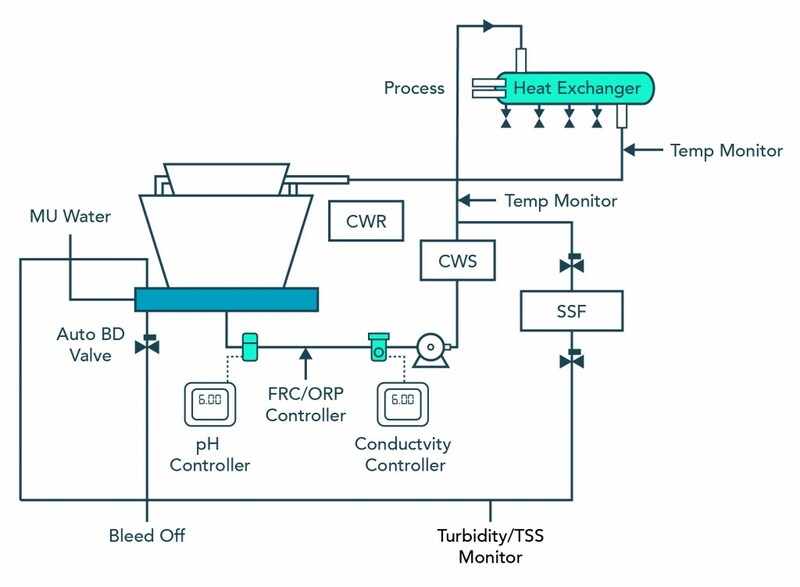 Based on the reading from the sensors, a conductivity controller can open or close valves, allowing automatic cooling tower bleed off or side stream filtration. Cooling tower bleed off is when cooling water with high conductivity levels is discharged from the system. Replacing cooling tower bleed off with fresh source water lowers the conductivity of cooling water. Side stream filtration is another way of lowering cooling water conductivity, wherein a portion of cooling water is passed through a sand filter, removing some of the solids. Side stream filtration is typically monitored using total suspended solids (TSS) sensors. The best conductivity sensors for cooling tower water monitoring are typically robust, online sensors with a cell constant of 1.0. Unlike wet cooling towers, dry cooling towers have a relatively low temperature profile and do not rely on evaporation. This reduces the risk of scaling in these systems. However, the risk of corrosion is still significant in dry cooling towers, due to the high solubility of dissolved oxygen at low temperatures. Additionally, low temperatures may promote microbial fouling due to the ability of bacterial populations to survive in the cooling tower environment. An effective microbial control program focuses on the specific microbial communities damaging a cooling system. Appropriate biocides may be selected, perhaps in conjunction with dispersants to penetrate and remove deposits. Chlorine oxidizing biocide is commonly used in biocontrol along with some non-oxidizing biocides. In heavy stress systems, bromine or chlorine dioxide serve as more powerful oxidizing disinfectants. ORP sensors can be used as part of a cost effective treatment control system. However, it is important to note that ORP is not a direct concentration measurement. When treating cooling water with multiple oxidizing biocides, all of the oxidizing species will impact the ORP reading. Microbiological treatments may require control of pH and other water quality parameters to ensure maximum effectiveness. For example, chlorine oxidizing biocide is most effective between pH 6.5 and 7.5. Cooling tower water treatment systems often include pH sensors and pH controllers to monitor the pH of makeup water. The most important instrumentation control parameters in cooling tower water treatment are Conductivity and pH. Additional water quality parameters that should be measured online or sampled frequently include turbidity, total suspended solids (TSS), free chlorine, and oxidation reduction potential (ORP).